What kind of games can be entered? Any game (in any format… non-digital or digital) that enables players to learn something about business, the running of an organization, or a discipline that directly applies to business, management or work can be entered. Games can target executive development, people studying business in school or university, or anybody in the public or private sector work space – it’s wide open. Entries can be anything from simulations to games that help people learn things such as strategy, project management, how to give people feedback, teamwork, how to make better decisions, communication skills… the list is almost endless. In addition to the opportunity to win an award, it’s an opportunity to get feedback on your game(s), it is a great way to get exposure and possibly even secure distribution to markets you cannot reach on your own. My game is not in English, can I enter it? Yes. Games can be in any language (though the submission needs to be in English). If the Institute doesn’t have judges who can speak the game’s language, you may be required to assist judges play the game. The Judges can speak English, French, Italian, German, Greek, Japanese, Portuguese, and Spanish and have the ability to call on support for Arabic, Chinese, and Farsi. There is a nominal €100 plus VAT registration fee (approx US$120) to cover administration. The fee is payable on entry. Note, if a game makes the final, at least one person is required to Showcase the game and attend the Awards. Yes but please note, at least one person is needed to Showcase every game that makes the finals. Can I submit a game that has won another award? Can I submit a game that has been submitted to this competition in previous years? No, a game can only be entered in the International Business Learning Games Competition once. 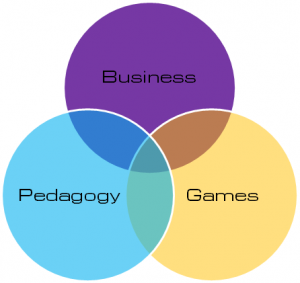 The games are evaluated by an international panel of judges who combine pedagogical, business, and game design expertise. When will we be informed if our game makes it through the first round? The entrants will be notified by Saturday 27 July 2019. Games that make it to the finals, qualify for inclusion in the Games Showcase at the International Business Learning Games Awards. The winners will be announced on the first evening of Conference, 19 September, at the International Business Learning Games Awards Ceremony dinner. Where are the International Business Learning Games Awards held? In 2019, the competition finals, Games Showcase, and Awards will be held in parallel with the 4th Annual International Business Learning Games Conference in Lisbon, Portugal. The conference is being hosted by Universidade NOVA de Lisboa. When do tickets for the Games Showcase and Awards go on sale? Tickets go on sale on 25 January 2019. This year the conference is in central Lisbon and there are lots of hotels and Airbnb options nearby. Some hotels near the Confernece venue include: Novotel Lisboa, Hotel ibis Lisboa Jose Malhoa, Sana Malhoa Hotel, Hotel Açores – Lisboa. Tell me about the Business Excellence Institute? The Business Excellence Institute is a membership organization headquartered in Dublin with members on 5 continents dedicated to helping people – and the organizations they work for – achieve outstanding results for all their stakeholders. It promotes business excellence as a multi-disciplinary profession, excellence in management, and the use of innovative approaches to personal and organizational development.